Combines every essential big game tool in a Cordura Roll-Pak organizer. Includes Kodi-Caper/Kodi-Skinner Combo, Axe-It, Griz-Saw, Steel Stick (Ribcage Spreader), folding boning knife, Cerama-Steel sharpener, pen, tape measure, flagging tape, zip-ties, large hand towels and game cleaning gloves. Additional sheaths for the Kodi-Combo, Griz-Saw and Axe-It let you carry these items separately. 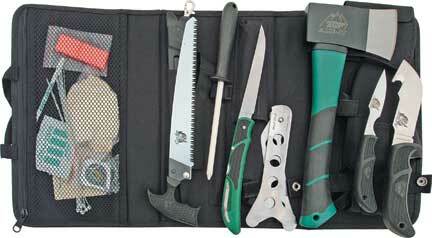 Individual compartments with Velcro closures allow easy access to each tool. Top zipper compartment stores the pen, tape measure, flagging tape, zip-ties and game cleaning gloves. Cordura straps let you cinch the Out-Pak outside a backpack or carry this set inside your pack.